The presence of several regional and international vendors in the global humic acid market makes the market increasingly competitive, finds Transparency Market Research (TMR). The global market is also characterized by fair degree of fragmentation. Numerous prominent players are leveraging the advantage of their strong brand value built over years, in order to retain stronghold in the humic acid market. TMR observes that several vendors in the global humic acid market are increasingly focusing on tapping new, promising avenues in emerging economies all over the world to garner large competitive gains in the coming years. Top players operating in the humic acid market are Humintech GmbH, Biolchim S.p.A., Humic Growth Solutions, Black Earth Humic LP, and Arihant Bio Fertichem Pvt. Ltd.
TMR projects the global humic acid market to expand at a robust CAGR of 12.1% during 2016–2024. The global market stood at US$387.1 million in 2015 and is projected to reach a revenue worth of US$1.04 billion by the end of the forecast period. Among the various applications areas, agriculture is anticipated to be by far the most revenue generating over the assessment period of 2016–2024. The agricultural segment held over 50.0% of the revenue in the global humic acid in 2015 and is expected to rise at lucrative pace in the next few years. The growth is driven by growing adoption of economically- and environmentally-friendly ways of farming across the world. 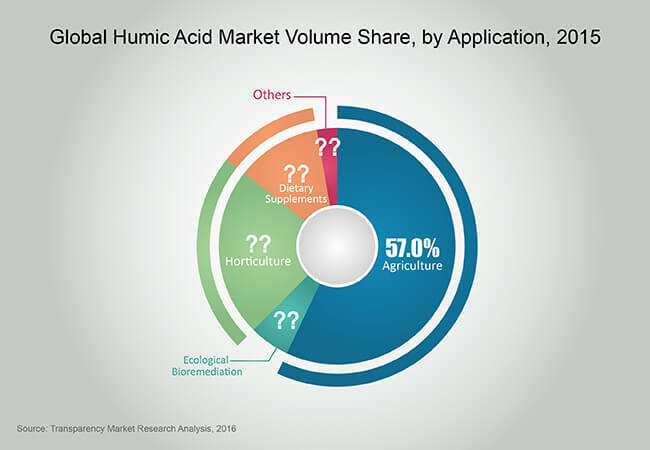 On the regional front, North America led the global humic acid market in 2015 by contributing about 40% of the total share. This regional market is expected to hold its sway throughout the forecast period. The prominence can be attributed largely to the widespread demand for organic products and the easy availability of raw materials. The global humic acid market is driven notably by the rising demand for humic acid by farmers and agriculturists as a remarkable soil amendment. There is growing use of this natural acidic organic polymer in increasing nutrient uptake in plant, decreasing toxin in the soil, and in improving soil structure of various types. The rising adoption of organic foods of farming, in light of growing popularity of organic food across the globe, is a key factor boosting the humic acid market. The rising use of humic acid in horticulture, ecological bioremediation, and dietary supplements applications is a notable factor propelling the humic acid market growth. The humic acid market is also catalyzed by the rising investments in adopting sustainable ways of farming in agriculture and horticulture. In particular, there is a promising demand for humic acids in agriculture for soil and foliar applications is on account of their functional benefits in reducing the use of fertilizers and pesticides. In addition, humic acids are also gaining traction among farmers to increase their yield. The steady growth of the humic acid market, however, is constrained by the lack of standardization in commercially available humic acids in various parts of the world. However, the ease of availability of raw materials in developed regions, especially North America, and constant thrust on innovation will help vendors unveil better products. Moreover, the humic acid market is expected to witness lucrative avenues in emerging economies, especially fueled by the growing adoption of organic methods of farming.